It isn't inspired, but the Inspire does the job if you want a step counter with style, and not much more. Fitbit has re-tooled its entire line-up of lower-end fitness trackers. The Fitbit Alta and Flex are out, the Fitbit Inspire is in. This is a slender band with a display, similar to the Honor Band 4. But here we but up against the Fitbit Inspire’s big issue. It’s more expensive than the Band 4, but doesn’t have a heart rate sensor, a color screen or GPS. The Fitbit Inspire is pleasant to use and has nicer animations than most low-cost rivals, but these days it seems a lot to pay for such a basic tracker. Blame China. You can buy the Fitbit Inspire now from Fitbit itself or a variety of different third-party retailers. You'll be spending £69.99 / $69.95 / AU$129 to buy this, but you may be able to find it discounted from that in the coming weeks. That's quite a bit more expensive for those that live in the UK, when compared to the US price. The Fitbit Inspire HR is a touch more expensive at $99.95 / £89.99 / AU$179.95. The Fitbit Alta is the Fitbit Inspire’s closest relation, its grand-pappy. It’s an inch-wide band with a rectangle of screen at its centre, and is plainer than the Alta. There are no bevelled sides to separate it from the numerous Chinese band-style trackers. 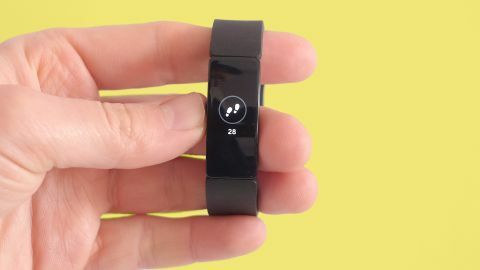 This might be one of the first Fitbits we can’t recognise from 50 paces. Fitbit has made the strap easy to replace, though, and this opens up something it’ll do better than any low-cost alternative. You can already order “official” leather, steel mesh and patterned bands, to get away from the pedestrian look of simple silicone. Little levers sit on the underside of each strap half, much like those of some normal watches. You can get the Fitbit Inspire in black or dark red, and both come with small and large strap sizes. The Fitbit Inspire strap is not particularly gummy, with the extra “give” that makes a tight fit comfy. But it doesn’t matter. This model does not have a heart rate sensor, so you can wear it tight or loose, whatever feels better. As such the Inspire is extremely comfortable. Like many of the comfiest trackers, you may well find yourself checking it’s actually there every now and then. We did. Like most lower-cost Fitbits, the Inspire uses a simple clasp rather than a full watch-style fastener. The screen covering is also plastic rather than glass. It feels hard, and we’ve not managed to scratch it yet. But a hardened glass would be better, as seen in the Honor Band 4. Some entry-level trackers use only buttons, or only touchscreens. The Fitbit Inspire has a mix of both. There’s a button on the side, which acts as both “back” and a screen on/off toggle. Once the screen’s actually on, you use up and down screen swipes to get between the various info pages. You use taps to select things in a few areas, but there are no odd gestures to worry about, just up and down swipes. This is one of the Fitbit Inspire’s strengths. It’s easy to use, and most people with a cursory familiarity with trackers shouldn’t need to as much as glance at a help doc to get started. The Fitbit Inspire’s actual display is basic. It’s a monochrome OLED. While it doesn’t leave a halo of light around its border, the unconfirmed but clearly low-ish resolution gives it a scrappy quality. Typical of Fitbit’s added attention to design, the interface’s bouncy transition animations and bold, consistent icons give the Inspire something bordering on a personality. You have nine clock face options, and all but one are digital. Judging by the one we do get, this is for the best. As the screen is quite narrow, there’s not a huge amount of room for an analogue face. There are no particularly dynamic digital faces either. Most use conservative fonts, and only one gives over a lot of the screen to fitness tracker stats. Honor’s Band 4 has even fewer watch face options, but those on offer do have a more distinctive look. In part this is a symptom of a monochrome screen versus a colour one, but Fitbit could eke out more character than this.